What happens when you close a street to cars, and open it up to people? 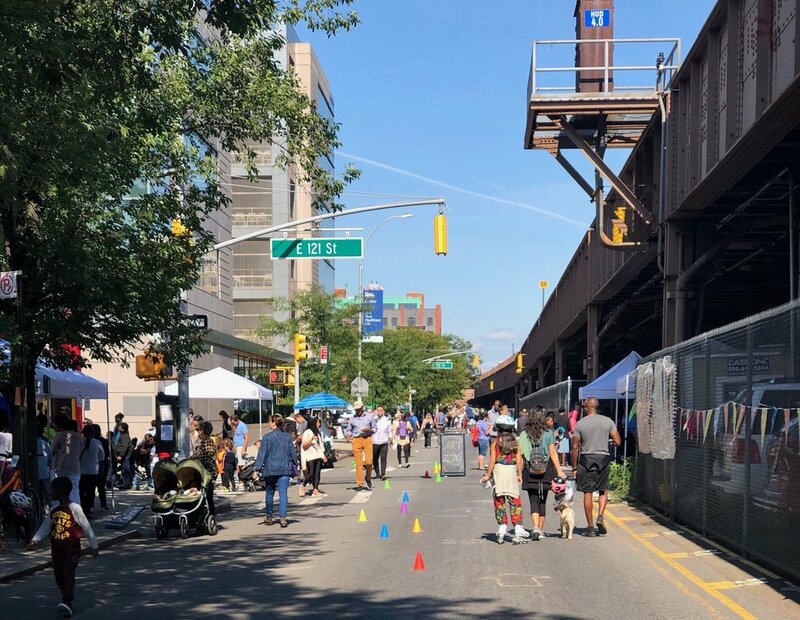 We found out during our second annual Party On Park -- when we opened Park Avenue from 118th to 125th streets for biking, strolling, dancing and more! 12-7 p.m. — Oldschool D.J. Tedsmooth, Master Z, Kenny Maneuver, Mellstar, Do It Like Diddy, Nel Wonder, D.J. Cre8, Danny Dee, Eddie B. Swift, Erika the D.J. will hold down the community plaza at 125th Street with the best of 1970s, 1980s and 1990s jams, all family-friendly tunes. TedSmooth is known for bringing special guests toward the end of his jams, so plan to stay until the very end to get your selfie with a star. 12-4 p.m. — All afternoon long, Citi Bike will offering FREE test rides at the Citi Bike station at 124th Street. You can also pedal a blender bike and a cellphone-charging bike, get your bike tuned, plus get the details behind the construction of the MTA Second Avenue Subway. 3 p.m. — Ready for a longer route? Join El Barrio Bikes for a group ride departing from the El Barrio Bikes tent in the Transportation / Bike Zone. The ride will be lead by a trained group ride leader and head uphill to the Cloisters at Fort Tryon Park. No bike? No problem! Riders 16 years old and up can try a Citi Bike for FREE. 12-4 p.m. — Visit a wide range of Harlem health providers who can fix nearly every single one of your body parts (dental, podiatry & flu shots)!, plus training on opioid overdose prevention. 12-4 p.m. — Get your face painted, decorate your helmet with Creative Art Works, try your hand at comic-book drawing with Dare2Draw, watch live graffiti writing by Slone, map it out with the Museum of the City of New York, and make your mark on a new 125th Street light-reflective art installation with LadyKFever & the 100 Gates Project. 2 p.m. — The Story Pirates LIVE! 3 p.m. — The Story Pirates LIVE! 12-3:30 p.m. — Kids can test-drive a Strider balance bike, and all ages can get custom-fitted by the NYC Department of Transportation for a FREE bike helmet to take home. 12-4 p.m. — Free financial and legal resources, a history exhibit by the Harlem African Burial Ground, East Harlem environmental info from NYC Parks, and meet-the-members of our very own Community Board 11. For photos from last year's event, check out our album on Facebook, or the NYC DOT photo stream. Want to learn more about the new Bike Share stations and Bike Lanes in to Harlem? Click here for a Q&A with NYC Bike Share, here for a map of Citi Bike docking stations, and here for a map of Harlem bike lanes. Party On Park is organized by Uptown Grand Central, with support from the Reduced Fare Bike Share presented by Healthfirst, the NYS Department of Health's Creating Healthy Schools & Communities program, and the NYC Department of Small Businesses' Neighborhood 360 program.